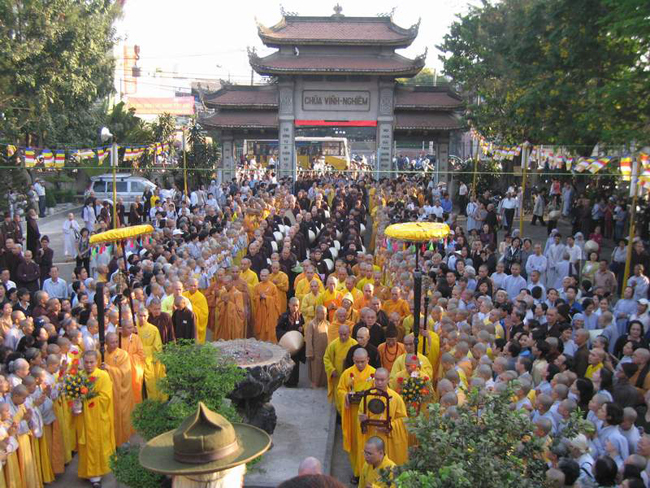 As the tallest stone tower of Vietnam in general and of Ho Chi Minh City in particular, Vinh Nghiem Pagoda wins an award for one of the must-see places for those who prefer to experience a spiritual journey. Located at Nam Ky Khoi Nghia Street, District 3, Ho Chi Minh City, the pagoda has a large campus with a wide area of more than 6,000 square meters. It is a sacred place not only for Buddhist monks and advocates to practice their belief, but also for both locals and tourists to come and pray for luck and happiness. So, it is not hard to understand why the number of people who flock to here increases time by time. The pagoda becomes a reliable and peaceful address for the citizens to keep their worries and stresses all under control! 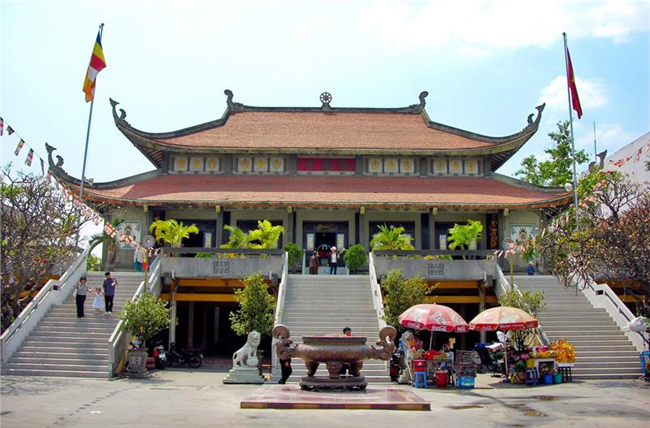 Built between 1964 and 1971, this temple was designed by Nguyen Ba Lang – a skilled and noted architect. With an excellent fusion of inspiration from traditional Vietnamese architecture and a modern touch of Japanese style, Vinh Nghiem Pagoda leaves you enthralled by its majestic beauty and incredible height of stone tower. The complex consists of the pagoda itself, as well as a 25-meter Devotee Relic Tower with 4 storeys that was finished in 1982. Established in late December 2003, the 14-meter stone tower inside the temple stands out as the first highest stone tower in the country. The tower is located in a harmonious position among striking structures of Vinh Nghiem Pagoda. Once standing in the main courtyard, your eyebrows will be raised by the highest stone tower, called a Kwan-Yin tower. Its 7 storeys and 40 meters in height contribute to making the pagoda’s name famous and widespread. The prominent features of the tower are its red roofs and curling gold banisters. Don’t hesitate to walk closely to contemplate the wall of each level that is nicely engraved with an image of a Buddha. You must climb the steep staircase to reach the doorway of the pagoda. After inside, what immediately draws your attention is the huge gold Buddha that sits on an altar at the back of the room. There are several smaller figures beneath him as well as a carpet of candles and flowers, donated by the locals. Step outside to relax and marvel at the stunning rock gardens and magnetic displays of bushes and trees that are designed as flowing spiral shapes. This is indeed an idyllic spot to escape from the noise and chaos of the city vibe. It is not hard to get to Vinh Nghiem Pagoda, thanks to its convenient location (in the city’s center). You can reach there by taxi, grab bike, or bus. If you hire a hotel somewhere at District 3, going walking is also a good idea. Just head to the corner of Le Loi and Nam Ky Khoi Nghia and then continue straight up Nam Ky Khoi Nghia Street. Along the road trip, there is nothing greater than dropping by the Independence Palace, or simply coming across the park to Saigon Central Post Office and Notre Dame Cathedral Saigon. Don’t forget to visit the War Remnants Museum as this place is also close by. See! Going for a stroll to Vinh Nghiem Pagoda is a stunning way to explore the most popular and fascinating landmarks around the city just with only one funny and meaningful self-made tour. Prepare something carefully before getting started!